We live in a rural area, and there are quite a few pests. Among the sneakiest are the wasps. They are hard to find but if you get too close, or bump into a shrub that hides the nest, you find them, way too quickly. If you’re lucky only one wasp pops you. Fortunately, the dog finds most of them. We’ll hear him yelp and I’ll gently search the area until I locate the nest, and then spray it. But even once I know where the attack took place, they can still be hard to find. 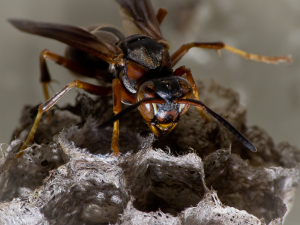 One day I was roughly pulling weeds from the shrubs, and bent a shrub over to get to the roots of a weed, only to discover a paper wasp nest with about a dozen wasps on it a foot from my face. My little girl was playing next to me, and I grabbed her and ran a few yards away. Nothing came out. I was puzzled; I had pulled the shrub over until the nest was almost horizontal, and as I said, I had been yanking weeds, agitating all of the bushes. I got some insect spray, gently approached and sprayed, then jumped back, because the spray sometimes elicits an attack. Nothing happened, they just died. Several friends offered explanations: it was the time of day, or the heat, or the humidity, or they were sick. I don’t buy it. I’ve surfed around on the Internet, I haven’t found any descriptions or explanation for paper wasps not stinging when disturbed. After thinking about it a while, I suspect it’s an example of small evolution, the kind that is acceptable to both Darwinists and creationists. I noted that wasp nests are hard to find, and we generally locate them when the wasps sting. The point of the stinging is to alert animals to keep away from the area. The problem is, humans are different. We have developed toxic sprays that can work from quite a distance. So when wasps sting people, they haven’t driven us away. They’ve told us where they are. And then we come back and wipe them out. So it was only a matter of time before a population of wasps appeared with decreased aggressiveness. They have doubtless appeared before in the wasps’ natural history. In the past, dealing with lower animals and humans without good counter measures, they were presumably at a disadvantage over aggressive wasps, and lost out in the struggle for life. But if non-aggressive wasps appear now, and prefer to nest around people, they are less likely to be wiped out. Living quietly near humans might give them an advantage. They might have access to our waste, particularly if it grows larvae. They might benefit from the clearings around our homes, or since many wasps drink nectar, from being around our flower beds. And we might keep some of the wasp’s natural predators in check for them. This is all conjecture of course. More observations and reports would have to be made of nonaggressive wasps (I am now sorry that I wiped mine out). And I am not yet sure what the advantages of living near humans might be. But whether or not my particular wasps were selected to behave differently, if there is some advantage to living peacefully around humans, sooner or later a line of wasps will appear that is nonaggressive. They will become ‘domesticated’, i.e., they will change to live around ‘the home’. It’s an example of how animals and plants can change, and humans too. As I noted, small evolution is critical for understanding how humanity has changed, and it makes no difference if humanity has been around for many million years, or only a few thousand years. Our biology, and our history, have shaped us. And we need to be aware of that to build a better world. ADDENDUM: Several people, including some biologists, objected to my thesis here, saying that the wasps didn’t attack because of the time of day, or because the nest was too small.1)If you disturb a tiny fire ant nest, the ants will often flee rather than attack. In October of 2017, we had another nest of non-aggressive wasps. My wife tried pulling weeds out of our beds at different times of the day, and she would see wasps fly out of from somewhere in the vicinity, but they never attacked. This is in contrast to another nest we had a few months ago, that attacked when someone even brushed the branch they were on. When we finally located the nest of the passive wasps, it was fairly large, maybe 7″ (18cm) across. When I sprayed them, they did not fly out to attack as wasps often do. Brown Paper Wasp courtesy of Wikimedia.org. 1. ↑ If you disturb a tiny fire ant nest, the ants will often flee rather than attack.